All Sage homes currently listed for sale in Sage as of 04/23/2019 are shown below. You can change the search criteria at any time by pressing the 'Change Search' button below. If you have any questions or you would like more information about any Sage homes for sale or other Sage real estate, please contact us and one of our knowledgeable Sage REALTORS® would be pleased to assist you. "Wonderful ranch nestled on 7+ acres of land. Charming single story custom estate with all usable flat land. This custom home offers 3 spacious bedrooms & 3 bath. Wonderful single story w/a very open floor plan. Wrap around covered porch for afternoon relaxation. Enter the home into a wonderful entry w/custom ceilings & bar area. Gourmet Kitchen w/top of the line appliance & custom beautiful granite counters & island. Large walk in pantry & lots of cabinets & storage. Enjoy cozy evenings in the wonderful family room w/large rock fireplace. Family room is open to the kitchen area. Cozy kitchen nook w/lots of light. All rooms are very spacious, large master suite w/French doors that lead out to the covered patio area. Lots of fruit trees & gardens. Wonderful horse facilities w/large mare motel & plenty of room for Large arena. Miles of trails for riding. All flat land & wonderful oak trees. 40 x 80 work shop with 3 overhead doors, wired 220 amp, 110 & 220 receptacles. Wired for a 3 phase converter. Perfect for the contractor for storing equipment or working on cars etc. Large 3 car garage w/an office. 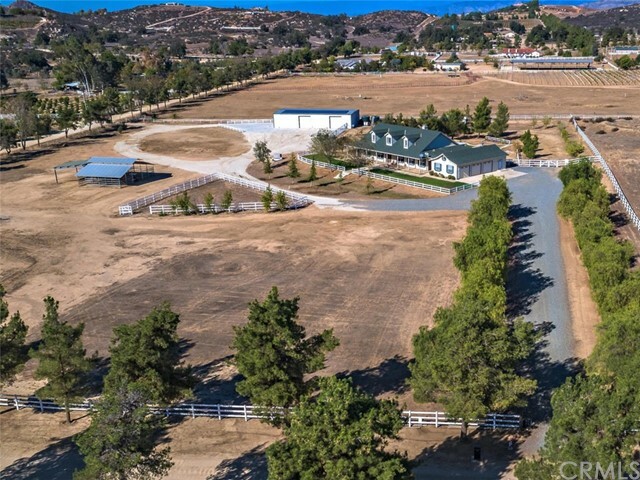 This wonderful estate is all fenced & cross fenced. 10 minutes back to Temecula makes this the perfect ranch for some peace & quiet. Wonderful location in Sycamore Springs Estates. Lots of water here with your own well and fully paid for 60 Solar Panels! Turnkey and ready to be enjoyed!!"